I vaguely recall that at some point in the 1990s, there were ads published in various Marvel comic titles, for a contest with some sort of promise to make the winner into a Marvel superhero -- specifically, the fan would be the temporary embodiment of Captain Universe, as host of the Enigma Force's Uni-Power. I believe the ads featured full mask versions of the costume, like the art shown on the Captain Universe TV tropes page, in male and female versions. I don't recall for sure if Marvel actually promised to include the fan-based character in some role in an actual canon comic or not, Earth-616 or otherwise. What became of that? Was a winner formally announced? I see no mention of this on the official Marvel site's character capsule, nor in the Wikipedia page. 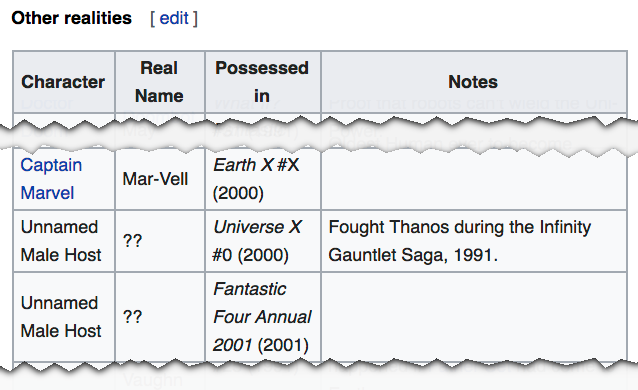 So I thought perhaps it could be related to the 2000 Universe X, but I see no further evidence for such a connection on the Wikipedia page for Earth X and Universe X. Or am I remembering wrong, and it wasn't a contest, but perhaps some sort of gimmick where they'd send anyone who mailed a check some marginally personalized comic? His Marvel bio mixes fact and fiction. Not the answer you're looking for? Browse other questions tagged marvel comics captain-universe or ask your own question. Which Marvel superhero has fought against the most fellow superheroes? Who was the first Marvel superhero who was an active part of two different superhero teams? Is there an element similar to Kryptonite which weakens or kills a Marvel superhero?